July 9th, 2007 : Sunny and Hot , Water Temp 85* and Clear. Picked clients up this morning at 5:15 and went uplake and caught Herring. Caught over 200 and went looking for a school of Stripers. Found a nice school in a channel bend in 35 feet of water , put 8 downlines in their faces rigged with Herring and the action began. Probably a little too much action too early for it was difficult for the guys to keep up with the action. We worked the school for 30 minutes and then looked for another 30 minutes and set up on a school in the mouth of Contrary. We got 10 hits in about 5 minutes but not putting a keeper in the boat I made the decision to move on and find fish that wanted to eat. We hit a 40' flat and stayed on it for an hour or more constantly getting bit. Ran out of bait and went and caught 100 more Herring. Set up on yet another school in 30' of water and every line we had out hooked up all at once. I called John in to help with the school and we ended up our morning there. 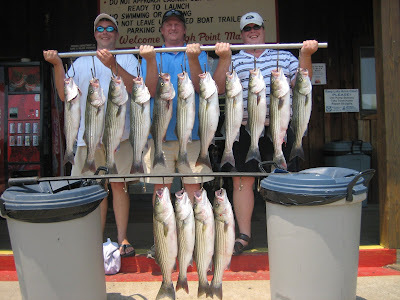 Today we had well over 200 strikes ,clients catching 30 Stripers, 8 Cats and keeping 15 Very nice Stripers to take home.